The 1741 Gemeinhaus is home to the Moravian Museum of Bethlehem. Here, visitors will delight in the unique stories and history of the Moravians who founded Bethlehem. Opening the herringbone-patterned doors reveals a place which served the entire community as home, school, church, and workspace during Bethlehem's earliest years. 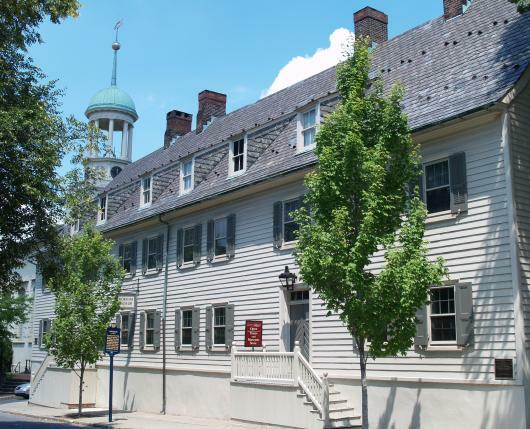 This National Historic Landmark is the oldest surviving building in Bethlehem, constructed in 1741 by Bethlehem’s Moravian settlers. You can discover how the 18th-century Moravian missionaries survived in the New World and grew their community in Bethlehem. Plus, visit the Saal to see Bethlehem’s earliest Moravian place of worship. This site is operated by Historic Bethlehem Museums & Sites. Open Friday through Sunday, 11 a.m. to 4 p.m.; Monday - Thursday by appointment only. Purchase your Museum Pass at the Historic Bethlehem Visitor Center. Groups of 10 or more enjoy discounted admission and access to special sites unopened to the public. Click here to request your custom tour.